Add-ins in Outlook.com are programs or utilities that help you automate tasks when you view or create messages. 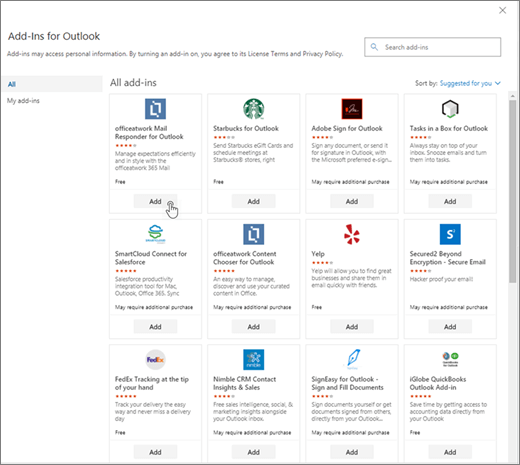 Microsoft has partnered with leading companies to build add-ins that help you get things done right from your inbox. How do the add-ins work? A﻿dd-ins have access only to the data in the email message that you're working in. All add-ins are validated by Microsoft, including those that you install from the Office Store. For more information, see the privacy statement and the terms and conditions section in the add-in’s consent form. How do I turn on or turn off add-ins? 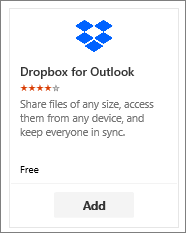 Click the drop-down menu on any email message in Outlook.com, and then select Get Add-ins. On the Add-ins for Outlook page, select the add-in. For free add-ins, click Add. For paid add-ins and free trials, select Get it to finish your purchase. You can also install more add-ins from the Office Store or Microsoft AppSource. 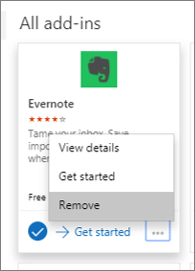 To remove an add-in, select the add-in, right-click it and then click Remove. You can pin an add-in so it's easily available when you're composing an email message. Select Settings > View all Outlook settings > Mail > Customize actions. Select the check box for the add-in that you want to see when you’re composing a message. What are the requirements to use add-ins? 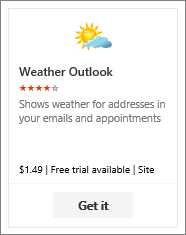 Your Outlook.com account supports add-ins. How do contextual add-ins work? 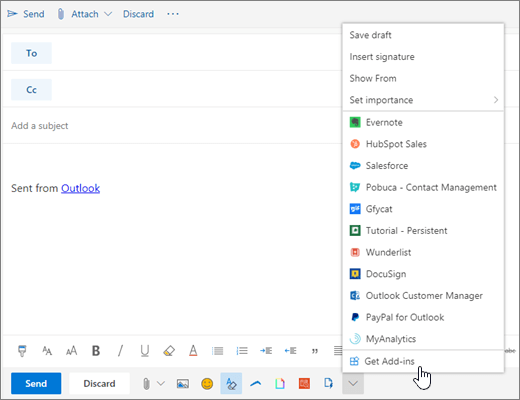 Outlook detects if add-in requested keywords or entities, such as meeting suggestions or addresses, are in your message, and it underlines them. Please note that Microsoft always safeguards your privacy and doesn't attempt to read or comprehend your message. Even though you might see underlined text, no information is sent to the add-in. Remember, the add-in can run only after you have given your consent to activate it and you selected the underlined text. Does the add-in send my data to third-party service? If so, why? An add-in might send data to its own service, but only to complete the task you've requested. For example, the Bing maps add-in might send information to the Bing online service in order to find the location you've requested. All add-ins are required to comply by their privacy policies and Microsoft standards. See the add-in's privacy statement for more details. Where can I get more information about an add-in, its ratings, and reviews? Go to the Office Store, and search for the add-in you're looking for. Then, select the add-in to find information such as its overview, requirements, ratings, and reviews.